Lily & Val Living - Page 2 of 64 - A pretty place for all who love the simple things in life. Spring is in the air…we can just feel it! If you’re looking for a quick way to refresh your wardrobe, adding some colorful accessories will do the trick. These handmade makers offer some beautiful options to add to your warm weather outfits. These beautiful Gentle Spring Polymer Clay Earrings feature beautiful florals, which means you know they are a favorite around here. Feel like getting something special for Easter? These adorable bunny earrings are super cute and a little on the nose, but they maintain their classy look in this small all gold style. These beautiful personalized hand stitched bandanas at a festive floral touch to a classic and very versatile bandana. Use as a neckerchief, head scarf, bracelet, or tie to your favorite purse to add a little color to your outfit. You know how popular bees are around here, so these gold bee earrings are just perfect for any spring outfit. We love how dainty they are. Bring back that youthful look and add a big hair bow to your look this spring. These chiffon layered hair bows come in some beautiful colors! If you really want to add something unique to your wardrobe this spring, check out the amazing selection of vintage spring clutches on Etsy shops like the ones seen here. We hope you enjoy adding some of these items to your spring and summer outfits this year. Happy Shopping! The clocks have sprung forward, the days are longer, and I’m in a Spring Cleaning state of mind (let’s face it, it could also be the nesting)! Especially during this time preparing for baby, I was shocked to find out what’s hidden in a lot of our everyday products. So, I’ve been on a mission to slowly rid our home of toxic cleaners and cosmetics. When I set out to research natural cleaners, I quickly realized it’s much easier and simpler than I thought to make your own! I wished I had been doing this all along! So, to start my foray into homemade cleaning products, I thought I would share what I made – a DIY nontoxic counter spray cleaner that is very versatile! Apparently, natural “orange cleaner” has been a Pinterest sensation for a while, but this was my first time hearing about it! If you, like me, haven’t given it a whirl yet, this post is for you! Fill your mason jar with as many citrus peels as you can fit. Then top it off with vinegar to the brim! Seal the jar. Now we wait… The mixture will take about two weeks stored in the cupboard in order for the citrus oils to infuse with the vinegar and create a cleaning concentrate. I set a reminder on my phone for two weeks later so I wouldn’t forget. After the two weeks, strain the vinegar into a pyrex with a spout (this just makes it easy to transfer into your bottle.) It should be a bright yellow color. Mix one part vinegar solution with one part water. I just eyeballed half my spray bottle with the solution and then topped it off with water. Add your essential oils and shake. I was able to fill both of my spray bottles and instantly ordered more bottles because I want to try other concoctions! The marker that comes with the chalkboard labels works well with a couple layers of inking. A chance to add some pretty hand lettering to your kitchen supplies – love it! I can’t wait to try my hand at other cleaning solutions like a dusting spray! I’ll be sure to share if I do. Let me know if you try this and what you think! The print pictured here was just released with our Spring Kitchen print collection! Find the prints here to give your kitchen art a Spring refresh, too! Happy March and almost Spring, friends! I’ve been working on spring cleaning lately and getting my house decluttered & refreshed. Nesting is definitely in full swing and watching Marie Kondo on Netflix has certainly added to this! Anyone, else?! So, for this month, I wanted to create a desktop download that also felt clean, simple, and fresh for Spring. I love these pretty pen and ink botanical wild roses and the neutral, calming look for your tech. I hope you enjoy! When the winter lull and cloudy skies get to you, a great way to beat the winter blues is to pick up a new hobby or skill. We have collected a list of some great DIY supplies and project ideas to help you tackle the long dark evenings. All of the supplies and kits below are from some awesome independent sellers on Etsy, so you can feel good about starting your new hobby and supporting a small business in the process. Who hasn’t seen those chunky knit projects and thought “I wanna do that”. Make yourself a cozy blanket or pillow with this beautiful selection of merino super chunky wool yarn. These jumbo knitting needles are perfect for so many chunky knit projects. Once you try these you will be hooked! I personally LOVE pottery and antique glassware. Salvage some beautiful finds or some of your favorite heirloom pieces by embracing the imperfects with the Japanese custom of Kintsugi. This Kintsugi Kit has everything you need to make the imperfections into something beautiful with gold that highlights the cracks rather than trying to hide them. What a beautiful way to honor the history of a piece. You have probably seen 1,000 uses for these cute little wool felted balls all over the place. We even did some tutorials on the blog here. If you are in to quick and easy projects, tackle a garland or add these to a plain curtain. They come in so many beautiful colors! Cross stitching and embroidery are also great to learn because there are so many ways you can use these skills once you learn them. This plant embroidery kit for beginners is so simple and so cute. Start making these little gifts for all your friends and family. Pressing flowers is a beautiful craft but also an amazing way to preserve and display petals that are special to you. I always collect and press flowers and leaves when traveling to use in a botanical frames or just keep in a journal. This flower press kit has everything you need to press the perfect delicate petal, plus you can have it personalized for you or as a gift for some other creative in your life. We hope you find a little something to help you grow and learn this season. You never know how far a new hobby or skill may take you. Friends, today we launched the long-awaited Lily & Val Wedding Collection. These products have been in the works for well over a year and to finally share them with you just makes me giddy. I wanted to show you some of the new items and also take a minute to give you a little backstory of why this collection, in particular, means so much to me. I first started drawing chalk art in 2012 right after I got married and that’s where Lily & Val began! Back then, I was making every chalkboard in my garage using chalkboard paint (wearing my very unflattering gas mask) and painting custom signs. 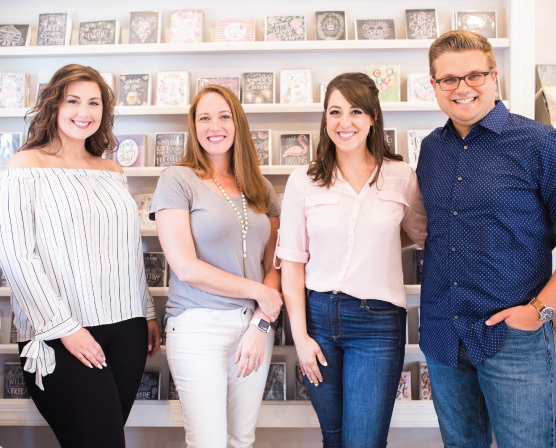 As I started this hobby I had no idea Lily & Val would even turn into a business, but my focus was primarily on two things – kitchen & weddings. As I think back to those early days I realize that seven years later, A LOT has changed, but this core has not. My passion for creating in these spaces is still very much at the center of the business. Once Lily & Val became known for chalkboard art and I had a growing business on my hands, it was more than I could have imagined. The verse Ephesians 3:20, “Now to him who is able to do immeasurably more than all we ask or imagine” has come to define my life. Many times I’ve forgotten this, but I have to remind myself that His plans are bigger. As time went on, I started feeling inspired and pulled to create more products and explore other mediums. I will be honest – fear often overwhelmed me and still does at times. I had just written The Complete Book of Chalk Lettering and I didn’t know if other products would be accepted and if Lily & Val could ever be more than chalk. Although I wasn’t abandoning chalk art, branching out was a very scary thing. I think anytime we pivot or explore new territory it is scary. It is unknown and risky. But despite that, I knew deep down that I had to try. I felt in my heart that what Lily & Val stood for (the nostalgia, sentimentality, thoughtfulness, celebration of simple pleasures) could be expressed in other ways. This transition started with the release of our Keepsake Kitchen Diary in 2015, a recipe keeper combined with a journal for storing memories and stories surrounding each recipe. Mak and I took a HUGE monetary risk to produce this book and had no prior experience in making products, but I believed in it because it was something I myself wanted to own. This item is now the number one selling product at Lily & Val, another step in this journey that is utterly surreal to me. Through manufacturing the Kitchen Diary, I came to realize that right alongside lettering and illustrating, producing meaningful, sentimental products tops my list of what fires me up. After expanding our Kitchen line, my sights were set on Wedding. Again, back to the roots of Lily & Val. We first released our Wedding Guestbook in the Fall, a sentimental twist on a traditional guestbook that isn’t just your typical, boring list of names! This product took around two years from concept to completion. We wanted to make sure it was something we ourselves would want to own. So much thought and detail went into this book! And now today, I’m so happy to release the rest of the collection to coordinate with our Guestbook and expand this category! Although the days of custom wedding signs are gone in this next iteration of Lily & Val Weddings, I still hand-draw & letter every piece (& every item we sell!) And although Lily & Val has branched out to more than chalkboard art, my sense of nostalgia for items that are simple and heartfelt has never been stronger. It’s a true joy to share these things with you! I just want to tell you guys again how much it means to me that you’re here- for supporting Lily & Val through the years. There’s much to the story in this post that I did not share – the failures, mistakes, and missteps (of which there are many), but your encouragement keeps me going. Your allowing me to put my heart out there in these products is a gift I could never express enough gratitude for. Bottom line is, I love what I do and you guys are the absolute best. Filled to the brim with pretty, hand-drawn details, sentimental keepsake items, wedding gifts, love-themed art for your newlywed home, and our first ever printable collection! The Newlywed Keepsake Kitchen Diary & Coordinating Recipe Cards. Wedding Note Cards & Note Card Sets. Wedding Dress Series using portions of Proverbs 31! Love & Wedding themed prints & canvas. An entire series of downloadable wedding printables to coordinate with the rest of the items in the collection! I cannot wait to hear what you think about these new items, friends! Thank you again, as always, for your support! For this month’s Pretty Ordinary Friday #102, we’re documenting snapshots of our month. While our pictures may not be the prettiest or the most interesting, we enjoyed each instance and want to remember them! These are the behind-the-scenes, in-between moments – the small peeks that would otherwise be forgotten. Join us as we use this series to scrapbook the unedited, memorable happenings at Lily & Val and what is inspiring our team! We all try to make healthy choices, especially this time of year! Since this is usually about the time that those New Year resolutions get a little tougher to stick to, we thought some pretty products would help motivate you to stick with your healthy living choices. This Leakproof lunch/ snack container with case is a great choice to help you stick to your healthy snacking and eating habits. Whether your are watching your budget or your waistline, this stackable insulated container is cute enough to motivate you to meal prep the night before. Another item you may need to bring your favorite healthy foods along is this waxed canvas insulated lunch tote. Perfect for him or her, this tote is a great size for all your lunch and snacking options. The face that it looks so great to carry is an added bonus. We all need to drink more water (especially all the pregnant mommas around here). This glass water bottle is pretty with a cute reminder to drink your daily dose of h2O. Your skin will thank you for using this bottle too. We all want to cut harsh and dangerous chemicals out of our life. Deodorants are a tough place to make the all natural transition. But give your body time to detox from your usual antiperspirant, and you will fall in love with this all natural safe deodorant. It’s the best we have tried to keep you smelling fresh! An easy place to cut down on unhealthy chemicals is by ditching your dryer sheets for wool balls . Add a few drops of your favorite essential oil for a fresh clean scent in your laundry. I love to use lavender and peppermint together on mine. Last but not least. If you are trying to make healthy choices for your home, try making your own cleaning solutions. There are tons of great tips and recipes online for how to use natural products to safely and effectively replace everything from surface cleaners to bug sprays. Keep your new cleaning supplies organized with this set of 3 tricolor glass spray bottles. You will easily be able to keep your solutions straight, and they are way more attractive to keep around your home than commercial cleaners. I hope you find something to help you make some healthy lifestyle choices this year, or at least make it a little easier to stick with the ones your have already started.